I was very quick to write off Afro Samurai when it was first announced. This was an anime with a ridiculous name, starring Samuel L Jackson not long after his appearance in Snakes on a Plane, on the “man’s network” Spike TV. So, being the high school anime/movie snob that I was, I thought for sure it was going to be garbage. And then I watched it, and it turned out to be really good. Actually, it was better than really good; it was amazing. The style was incredible, the story was tragic and interesting, and the soundtrack was beautifully composed by The RZA. It quickly became my favourite anime of all time. Naturally, when the first Afro Samurai game was announced, I got wrapped up in the fan craze and bought it without knowing a lot about it, giving it the benefit of the doubt. I wasn’t disappointed. The game was fast-paced, stylish, fun, bloody, and (arguably) introduced the slicing mechanic that MGS: Revengeance perfected. I had nothing but high hopes for the sequel. Unfortunately, like Kuma’s quest against the Number two, my excitement was in vain. 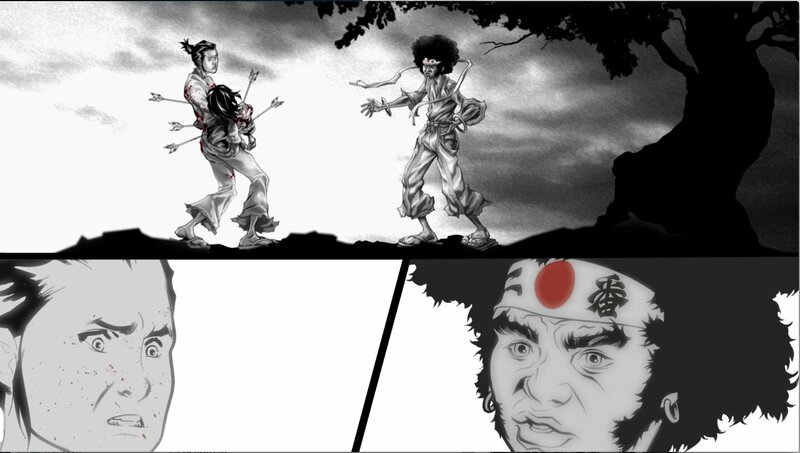 Afro Samurai 2 is a horrible experience not fit for any of the ten sacred headbands. Afro Samurai 2 is taking an episodic approach to its release, beginning with its first story following Kuma, otherwise known as Jinno, as he journeys to exact his revenge against his former brother Afro. The story is a mess; it’s constantly cutting to flashbacks or dream sequences without any sense of flow or cohesion and strung together by disjointed still images rather than animated cutscenes. While the manga aesthetic is interesting, it comes off as cheap, looking more like a PowerPoint presentation than a narrative cutscene. What’s stranger is that there’s no real sense of style as the game flips from slideshow, to interactive comic book, to animated comic book. It can’t commit to one narrative style and it makes the whole experience unenjoyable. Furthermore, a lot of time is wasted recapping the story of Afro and Jinno when most players who were invested enough to seek out the under-promoted sequel to the first Afro Samurai game probably already know it. It could have been time spent structuring a better story for Jinno. The gameplay in Afro Samurai 2 is absolute dreck. Gone is the frantic-yet-precise combo building of the first game, abandoned in favour of simplistic, single-button combat. I’m not joking; all combat in Afro Samurai 2 is mapped to square, with triangle being for blocking. Gone is the slow-motion focus kills from the first game, replaced by “styles” that can be switched with the D-pad. This could have been a unique function, but the combat is so stale and all the attacks look the same that you hardly notice a difference when changing styles. Also, there seems to be a delayed pause every time you change a style, so it never feels flowing and natural. The game also told me at the start that I had a rage mode at my disposal; however, I never saw any rage meter or any indication that I was gaining access to it. If it’s something that unlocks later in the game, why the game made sure to tell me I had it in the first combat tutorial is beyond me. Not that there’s much in the way of combat; you might fight three baddies over the span of half an hour of disjointed, boring cutscenes. The platforming sections are particularly dull. While they weren’t exactly ground-breaking in the first Afro Samurai game, they were at least fast paced with wall running and pole flipping. Jinno’s platforming sections all revolve around him slowly climbing up walls in the exact way you would in God of War. The whole experience is monotonous and breaks up the already shocking pacing. Visually, Afro Samurai 2 bears a lot of resemblance to its predecessor. The characters are all cel-shaded, giving it a comic book feel. 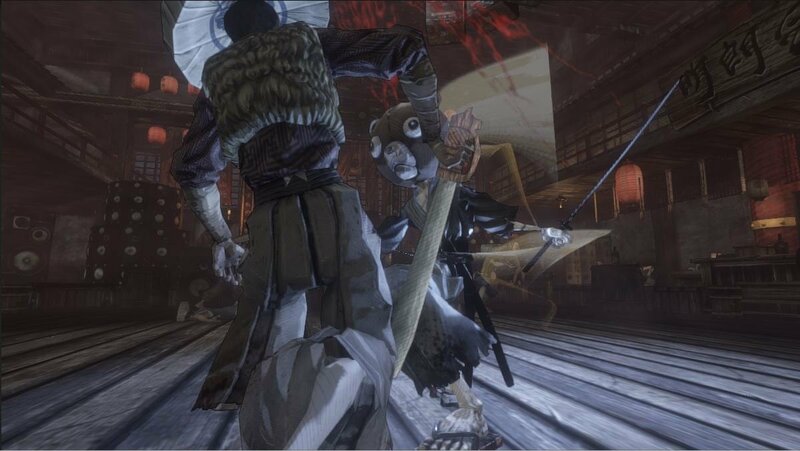 However, unlike its predecessor, Afro Samurai 2 does nothing interesting with locations, colour, or overall world feel. The textures are all muddy and boring and certain character models look particularly bad. There’s significantly less blood that the first, and it looks very clear and liquid, not like the dense reds of its predecessor that gave it a gory, anime feel. In the few moments that you do slice an opponent in half, their insides look like a horrible mess of stretched pixels and colors and it’s extremely unpleasant to look at—only not in the way it’s meant to be. While the cutscene manga images do look worthwhile, the way in which they’re presented manages to ruin even that. I will give credit where credit is due here, the soundtrack is pretty on-point. 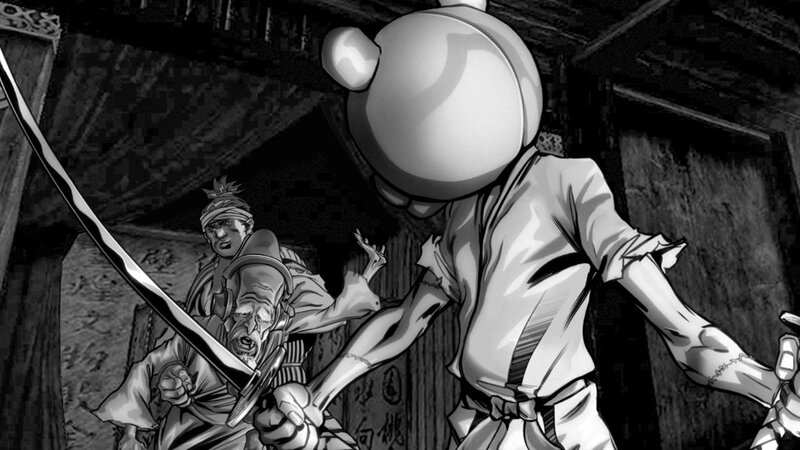 While not produced by the RZA the way the anime and the first game’s soundtrack was, supposedly Afro Samurai 2’s soundtrack is made up of a collection of indie rappers, hand-picked by the RZA himself. While they do a commendable job and their songs are great, there is a serious lack of an actual orchestrated soundtrack to work with all the hip-hop songs. What is left is a soundtrack that feels cheap; a game that reeks of the lack of budget and rather than have a real soundtrack they just threw a bunch of mp3s in and called it a day. The voice acting is well done, but again feels cheap and lazy as the same voice clips play over and over at different cutscenes. They even took the whole monologue that Ron Perlman did for the first Afro Game and just slapped it in for no reason. There’s no sense of audio balancing and certain voiceovers got so loud they caused feedback in my headphones. Even the game’s sound effects are terrible, with Jinno’s one loud, clompy footstep repeated over and over to simulate running, and his sword connection with enemies has a loud, punching sound effect as opposed to the first game’s clean slicing sounds you’d associate with a sword. Afro Samurai 2 is so bad it actually made me physically disheartened to play it. If you’re a fan of the series, and let’s face it, the only reason you’re playing the sequel or reading this review is because you are a fan, do yourself a favor and just play the first Afro Samurai game. Aside from a solid soundtrack, there is nothing likeable about this game. Afro Samurai 2 is taking an episodic approach to its release, beginning with its first story following Kuma, otherwise known as Jinno, as he journeys to exact his revenge against his former brother Afro.